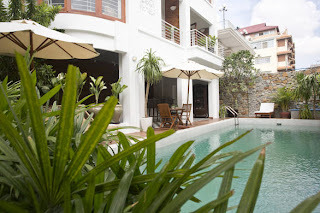 Delightful new boutique hotel in a lush garden setting. Located on a quiet street, the villa offers 14 rooms, suites and apartments outfitted with SentoSaSilk accents, most with balconies overlooking the grounds. The entrance opens into a lush garden alongside a black and white tiled area where you can sit and read under the trees or sip a cocktail before heading out for the night, and there’s a swimming pool and al fresco restaurant for entertainment. All rooms include fresh fruit, bathrobes, air-con and complementary breakfast and a giant stone Buddha statue overlooks the garden, scattered with padded wrought-iron chairs and tables. The restaurant menu includes a selection of salads, sandwiches, pasta dishes, curries and Khmer specialties (open from 6am to 10pm) and the location is within walking distance of shops, restaurants and the Independence Monument. “Even though I’m in the heart of Phnom Penh, I feel as if I’m in a remote resort when I’m at Villa Salt"
The modern exterior of Villa Salt exudes tranquility. A small pool surrounded by coffee tables and set amides greenery is visible as you pass through its gate. While walking toward the stairs of this hotel and serviced apartment complex, visitors will pass by a bridge with a size-able Buddha statue placed on the left-hand side. The pond underneath is fitted with mini-spotlights for dramatic effect. 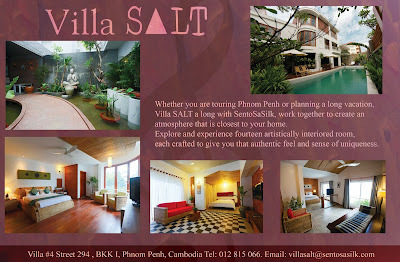 Villa Salt is the youngest in a string of local businesses that include Salt and SentoSaSilk boutiques. The villa contains 14 rooms of different sizes and design. No room is like any other, though the draping in each are made with SentoSaSilk’s 100 percent Khmer silk. Three of the 14 available rooms are spacious serviced apartments with kitchens, priced between $1,200 and $1,800 per month. 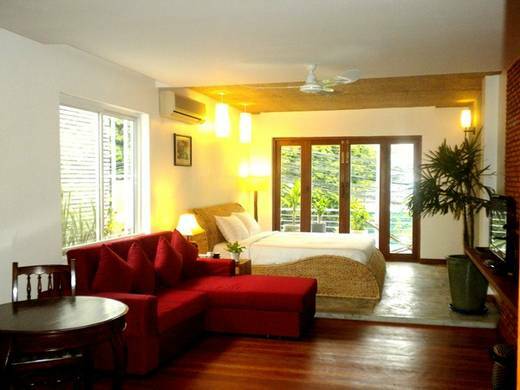 The 11 remaining rooms are divided into singles and doubles priced at $80 to $120 per night. Most of the rooms have their own terraces and are equipped with flat-screen televisions, fridges, internet connection and air-conditioning. 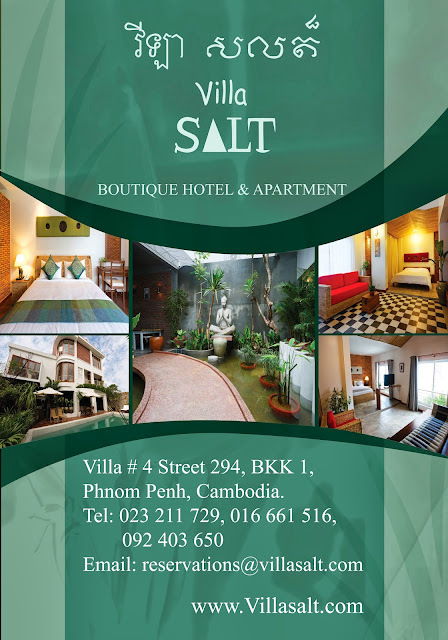 Located just a stone’s throw away from the corner of Norodom Boulevard and Street 294, Villa Salt proves a peaceful and quiet retreat despite the busy streets around it. With easy access to nearby restaurants, clubs and tourist destinations, the stress that travel can bring diminishes within its walls. The rooms are highly-recommended thanks to modern fittings and classy design. The concept of the villa’s interior is impressive. The nontraditional approach shows a will to stand out from the crowd. On a sunny Phnom Penh afternoon, the heat may be too much to handle, but the lush greenery that surrounds the villa compensates. Villa Salt lacks parking space to hold 14 cars. However it is mainly intended for tourists and a few long-term vacationers and its sister business Salt, located next door, can always lend a helping hand. Having opened in just a little over a month and constantly striving for perfection, Villa Salt is a gem waiting to be found.